Drop the app and ads! TourneyTime is 100% ad-free and provides a great experience on all mobile and display formats! Enjoy your bracket from anywhere. Simply create a free account, create an NCAA pool, and activate your pool through our payment process with a 100% refundable guarantee. Send invites to your potential participants using the invite manager, and your pool will come to life! The pool manager is the only one who pays, and it's worth it to avoid the clustered ad-crazy sites that bombard your pool participants. Participants NEVER have to pay to fill out a tournament bracket in your March Madness pool. 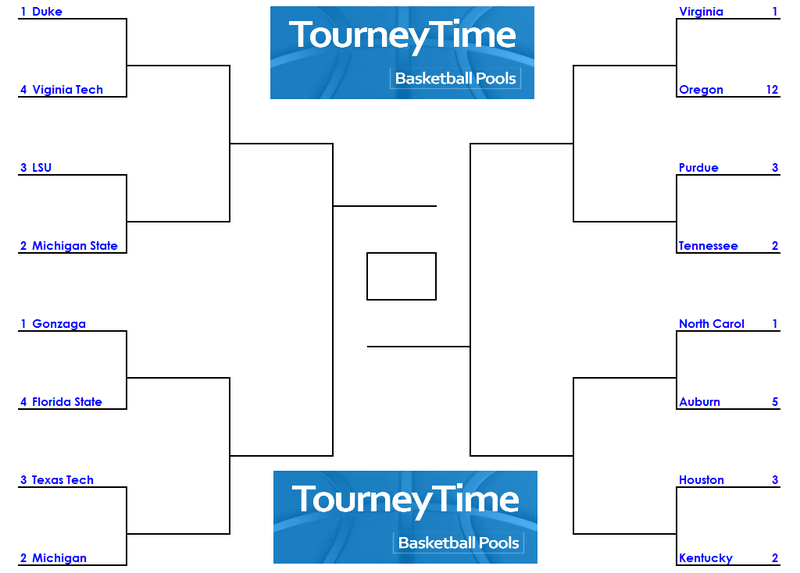 TourneyTime has been hosting basketball pools for 20 years. We understand how to run office pools online because we were doing it first. Now we've grown to hundreds of thousands of users across the world. With new competitors popping up each year, we thrive because of our commitment to great support, ease of use, and no ads. People who use us recommend us over and over again. March Madness pools can't get much easier. And don't worry if you just like to print your bracket, we've got that covered too. "It's worth it to stay year after year. TourneyTime has the bracket scoring options I need and basically you showed me how to run a March Madness pool well so I can watch more basketball."